Jeddah South pumping station is one of the largest pumping stations in the Kingdom of Saudi-Arabia. The two shafts have a diameter of 32 meters and a depth of 40 meters. The station has a screening facility to remove solids before being transferred to the nearby STP. 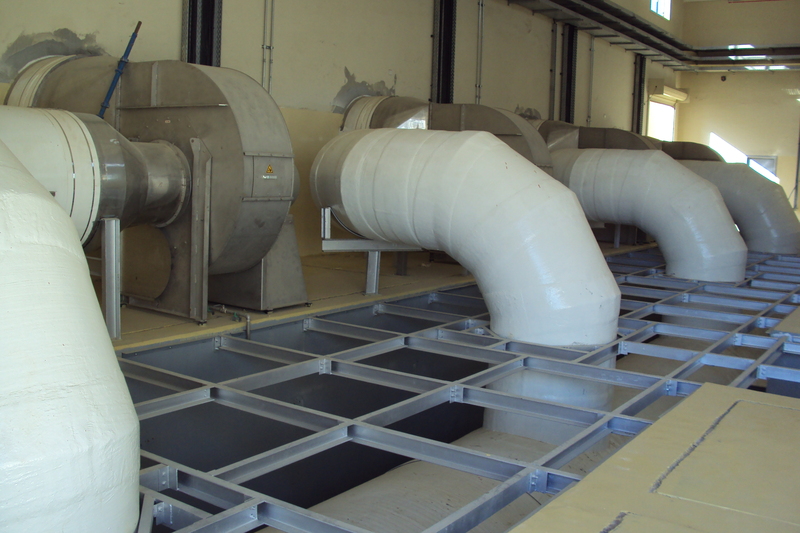 In order to treat the foul air of these large chambers, a chemical scrubber was required. Because of the wide experience in odour control, Ipec was approached to design and supply the odour treatment system. 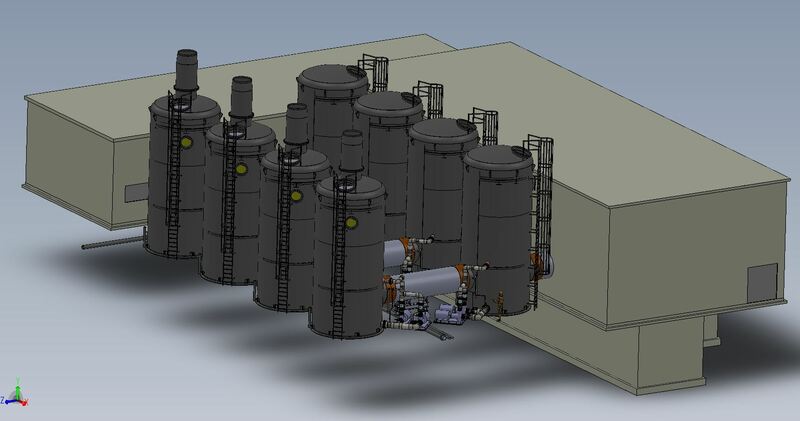 Because of the high H2S concentration in the foul air, Ipec designed a two-stage chemical scrubber system with a total capacity of 300 000 m³/hour. The system exists of four trains each individually treating a flow of 75 000 m³/hour. Each train holds a stainless steel fan connected to a suction manifold for air extraction from the different locations inside the pumping station. Each fan is provided with a pressure transmitter and flow sensor to control the flow by VFD. The air is blown by the fan into a first chemical scrubbing tower which is operated with an aqueous caustic liquid. In the scrubber, the air is brought into intensive contact with the liquid to allow H2S, mercaptans, … to pass to the liquid phase and to bind to the caustic. About 95 to 98% of the H2S is removed in the first step. To do so, the water is circulated over a packing material by a spraying system in the top of the vessel. The packing material combines a low pressure drop with a high specific surface to ensure a good contact between gas phase and water phase. Both the recirculation pumps and the dosing pumps are provided as duty-. The consumption of chemicals is carefully monitored by the PH-measurement and the H2S sensors available before and after each scrubber vessel. The first scrubber is fitted with a mist eliminator to prevent droplets passing to the next treatment step. As a polishing step, a second chemical scrubbing tower is operated with an aqueous solution of caustic and bleach. The recirculation liquid is carefully monitored by pH- and ORP-measurement to ensure an odour-free exhaust and a minimal chemical consumption. The second scrubber is also fitted with a mist eliminator to avoid droplets to escape through the stack. Because of the performant design of the odour control unit, the system can handle very high H2S concentrations. During peak periods the chemical scrubbers handle H2S concentrations up to 500 ppm and reduces this to odour-free air while keeping the chemical consumption low by the combination of precise PLC-monitoring, adequate recirculation and selection of proper packing material. 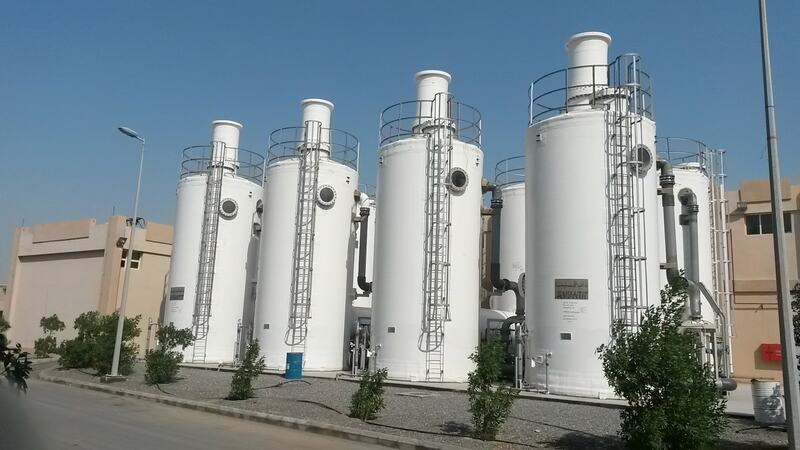 The chemical dosing tanks are located inside a cooled building to avoid the decomposition of the bleach under high temperature. Click here to download the leaflet in PDF.